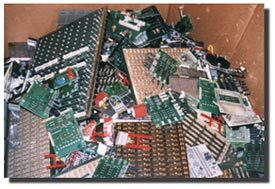 USGS Fact Sheet 060-01: Obsolete Computers, "Gold Mine," or High-Tech Trash? Obsolete Computers, "Gold Mine," or High-Tech Trash? As the importance of electronic systems in all aspects of technology has increased, so has the amount of computer waste. Because microchip development is so rapid, users can replace their current computers with newer, more powerful models about every 18 months. Significant amounts of material used in the manufacture of these obsolete devices -- including metals from wires and circuit boards, glass from monitors, and plastics from casings -- can be recovered, recycled, and reused.